Round, bite-sized gyoza. 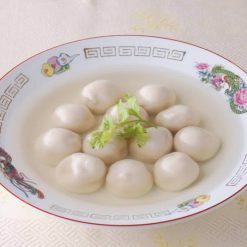 Can be served by themselves or used as ingredients in hot pot dishes. Product totals 192g (12 pieces). The outsides of these gyoza are extraordinarily soft when boiled. 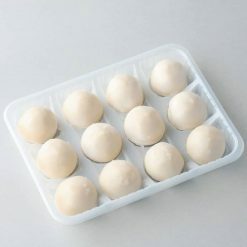 To make boiled gyoza (sui gyoza): Place the gyoza (still frozen) in boiling water. The gyoza are done when they have all fully risen to the surface (about 5 minutes). They can be eaten with soy sauce, chili oil, vinegar, or any sauce you prefer.To make gyoza on the stovetop (yaki gyoza): Distribute oil in a heated frying pan, then add the gyoza (still frozen). Add about 80ml of water, cover with a lid and steam-bake on medium heat for about 5 minutes. Just before the water has all evaporated, add a little bit of oil. Cook on low heat until the bottoms of the gyoza look pan-fried.To use in hot pots or soups: Bring the soup to a boil, then add the gyoza (still frozen). The gyoza are done when they have all fully risen to the surface (about 5 minutes). 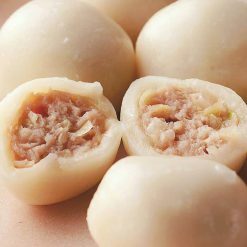 This product contains [Filling] Cabbage (domestic), pork (domestic), pig fat (domestic), gelatin, Welsh onions, soy sauce, potato starch, sugar, oyster extract, ginger, table salt, sesame oil, pepper [wrappers] wheat flour, tapioca starch, sticky rice flour, rapeseed oil, table salt.. 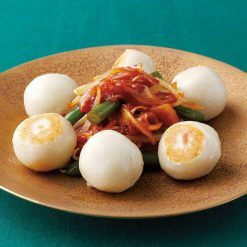 This product is not suitable for anyone with allergies to wheat, soy, pork, gelatin or sesame. Origin of ingredients: cabbage/pork/Welsh onions (domestic). Prepared and packaged in Japan.